Slender plant plant with a height of up to 20 cm and foliage leaves forming a rosette. The inflorescence consists of many small flowers. All sepals and the two upper petals form a closed hood. The labellum is deeply three-lobed, the lateral lobes are shorter than the middle one. The spur is pointing downwards. In 1799, the French botanist René Desfonataines (1750-1833) described the plant as Satyrium maculatum in his opus Flora Atlantica. 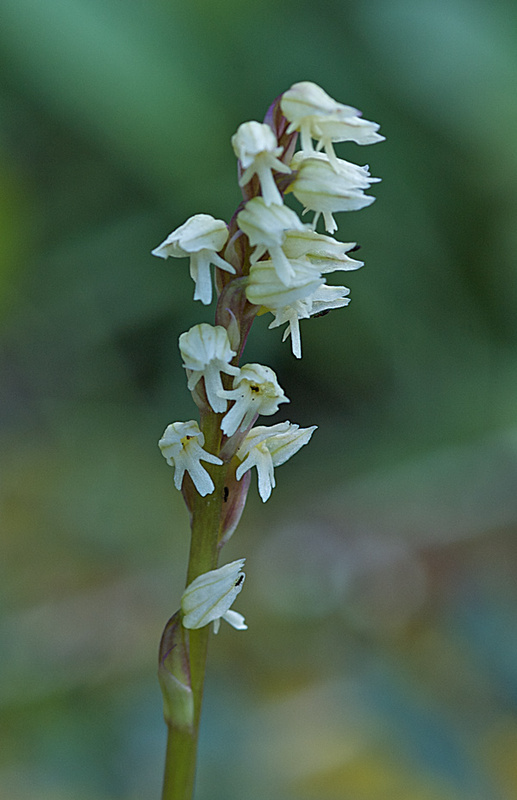 A synonym is Orchis intacta. In 1975, the British botanist William Stearn placed the plant to the genus Neotinea. The variebility of this species is rather broad, with colour varieties from greenish white to light pink and deep purple. Neotinea maculata is growing in light woods, up to 1500 m, on calcareous soils. Bloom is from March to April. The plant can be found from Ireland in the Northwest to Israel in the Southeast.